This tutorial explains how to use aggregate form views to customize the way you view data collected in form responses. 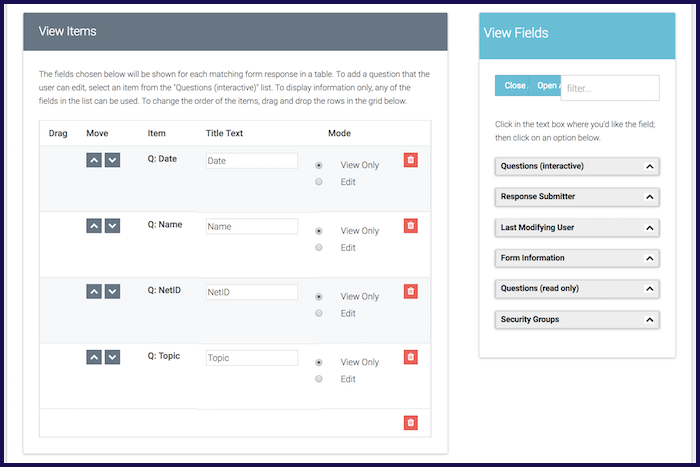 Aggregate form views can be used to compile specific sets of data collected from form responses. This is useful in situations where your form collects a large amount of information, but you only need to see specific sets of information from those responses. 1.) To set up an aggregate form view, select 'Aggregate Form Views' underneath the Form Contents heading on your form's Dashboard. 2.) 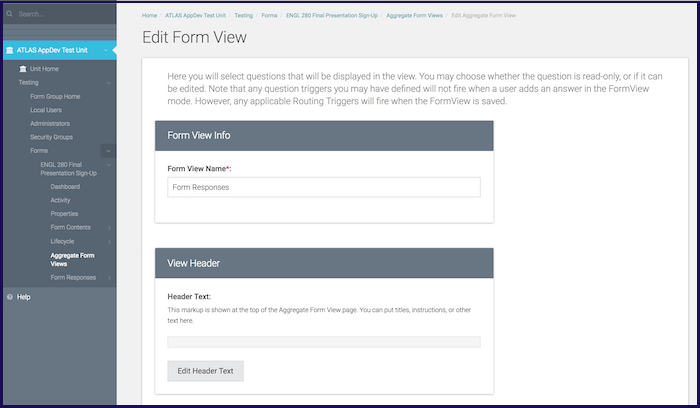 To create a new aggregate form view, select '+ Add Form View' in the Form Views heading. To edit an existing form view, select 'Edit' from the drop-down menu underneath 'Options'. 3.) 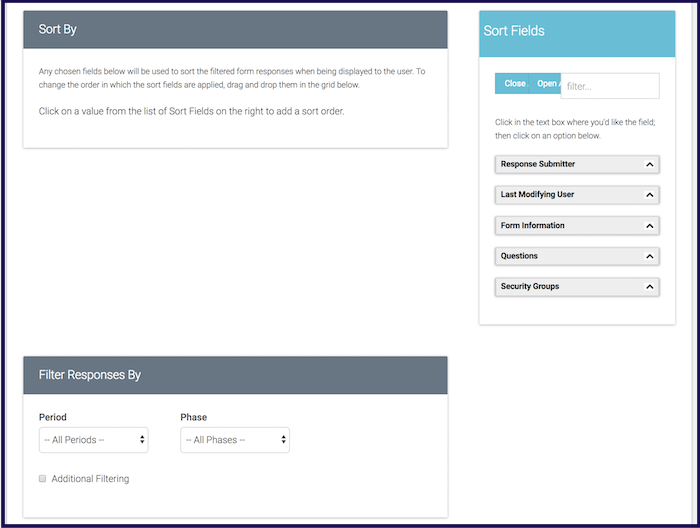 Several sections for form view settings will be displayed. Form View Info: Enter the name for your form view in the box provided. This is a way to differentiate between multiple form views; use whatever name you will recognize it by. View Header: Enter any additional instructions or notes you want included with the data. This text will show up above the data when you view it. View Items: Use the side panel buttons to add the question values you want included in the form view. In this section, you can designate whether you want the informational to be 'View only' or Editable' in the form view. Sort By: You can specify how the data is organized using the options in the sidebar. In the example above, the information is sorted based upon the date it was submitted. Filter Responses By: You can filter the responses to only include responses submitted in the current period and which phase they are currently in. No Response Text: If no submitted responses match the filters you have put into place, you can customize the message displayed until there are responses that match the filters. Who can access this form view? : This section lists each of your security groups. Select from the list who you want to give access to. For more information on how to create and edit a security group, check out ATLAS FormBuilder - Add a New Security Group. 4.) Remember to save your changes! 5.) 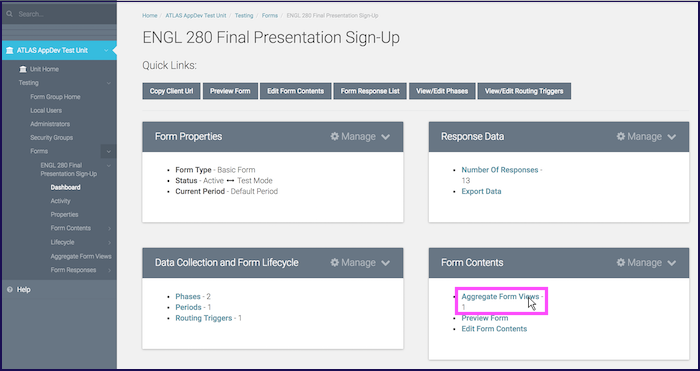 To view the aggregate form view, return to the Aggregate Form View page shown in Step 2 and select 'View'. 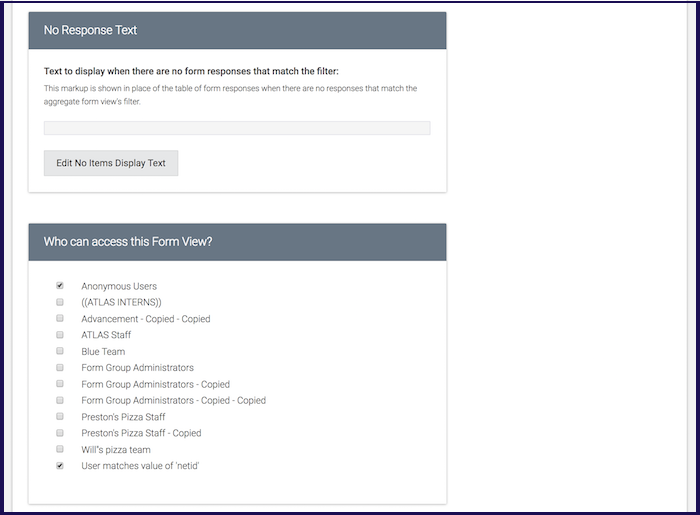 Your organized form responses will pop up in a list format like the example below.